As students, we learn to listen to our bodies, understand what they need and choose our practice accordingly. A dogmatic approach to yoga, believing in only one style, yoga class or yoga type, is not healthy. We are all individuals; we are all different; we all have our own stresses, injuries and lifestyle pressures. Power Living offers a range of yoga classes to suit every need and lifestyle. At Power Living, we empower our students to practice a mix of the core class types, offered at three different levels, depending on what their bodies need: Vinyasa – Heated, Vinyasa – Non-Heated and Yin. All classes provide different benefits: you decide which is the best option to help you regain balance. Can’t get to a studio? Practice anywhere, anytime with Power Living’s online yoga platform: YOGAHOLICS.com.au. Just $12 a month, with a 10-day FREE trial. Offering 24/7 access to: Unlimited videos of yoga and more; Step-by-step posture & sequence tutorials; Meditations and talks that inspire; Beautiful, fresh, quality content – updated regularly. Turn up the heat. This yoga class is the original Vinyasa practice – heated to 32 degrees. Expect it to be sweaty, dynamic and intensely satisfying. This powerful practice is the place to step up and transform both mind and body. We use the experience of fire created within the body to burn through the hardened exterior layers of the self, casting aside doubt and desire, setting our being free. Embrace a state of flow. This yoga class is dynamic, explorative and challenging. Incorporating creative sequencing, anatomical focus areas and traditional teachings, it’s the hallmark of intelligent asana. Using the physical body as a tool of transformation and self-discovery, we take you deep into the physical experience so as to surpass worldly distractions and arrive at a quieter place a little closer to home. Find balance. This subtle practice aims to still both the mind and body, offering an opportunity for meditation as well as physical relaxation. Working towards depth from a place of surrender, Yin targets the body’s energetic system and fascial tissue. Both systems are an integral part of achieving unity across body and mind. When functioning together, we create optimal communication, mobility and structure throughout the body. Take it to the edge. A series of 26 postures and two breathing exercises with each posture stretching and strengthening the muscles. This method also stimulates the organs, glands and nerves, moving fresh oxygenated blood around the body helping to restore all systems to a healthy working order. Heated to 38-40 degrees. Get ready to Roll & Release your fascia in this guided class using self-massage and gentle movement! A four-week introduction to Power Living’s Vinyasa Yoga, this course will give you the confidence to step onto your mat and refine your understanding of yoga asana. In each weekly class we’ll be breaking down a specific part of the practice. Establish alignment for all poses, how to breathe and move through the class plus basic modifications for a safe lifelong yoga practice. An amazing introduction to yoga newbies or those wanting to brush up on their yoga technique. Get ready to strengthen and tone your entire body in our exciting new Power Reformer pilates classes. These 50 minute open level classes will tone your core, sculpt your muscles and improve posture and flexibility – the perfect complement to your yoga practice. 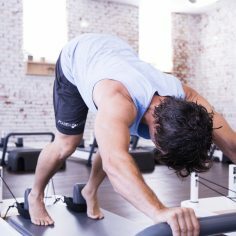 Our classes are open to all fitness levels from first time reformer users to the more experienced. Our group reformer classes are best suited to those without injuries. Start with a Vinyasa class, to free up the physical body and still the mind. Then flow into a 15-minute guided, group meditation to help you arrive in your still place. Join us as we raise the collective consciousness with those around us. Look for ‘Meditation’ or the symbol on the timetable. A playful Vinyasa class combining soulful tunes and dynamic, expressive asana sequencing. Let’s raise the vibration! Check out ‘Music’ or the symbol on the timetable. Power Living offers level 1, 2 and 3 classes to enable you to progress into advanced asana and allow your practice to soar. Establish the foundations for a safe, lifelong yoga practice. Slow enough to understand the basics of alignment and learn modifications, but still a strong class. You’ll also be introduced to some of Power Living’s core philosophical and traditional teachings. Ideal for beginners or those wanting to refine their practice. Open-level classes have become our ‘norm’. They’re challenging and all levels are welcome, but some experience of yoga is advised as there will be minimal modifications and education. Moving at a steady pace, these classes require a healthy, active body. Our level 2/3 classes are for anyone who is comfortable coming to a level 2 class and has the curiosity and drive to discover what's next. In this 90-minute flow class we will explore, workshop and develop a wider range of postures that will challenge, inspire and make you hungry for more. A self-led personal meditation focussing on self-enquiry or ‘Dhyana’, “Who am I?”. Allowing thoughts to flow freely, this is a deep inquiry into your truest nature. All of our senior teachers are available for private yoga classes. If you’re interested in a more individually tailored session you can opt for a one-on-one or gather a small group of friends together and do private yoga at home. Private sessions are a great option if you’re dealing with an injury or looking for a springboard to help you overcome any hurdles in your practice and explore new and uncharted terrain. We recommend private sessions to all our students to ensure you get the most out of every yoga practice. For more information, including teacher availability and prices, click here to contact us. All of our senior teachers are available for corporate yoga classes. They will come to your workplace at a time that suits you – all you need to do is provide mats, a venue and students. Or download our mobile app available on the Apple App Store or Goolge Play.